The Bain family house was a grim and squalid place even without bodies. If you're using an iPhone, iPad or a Mac computer, press here to sign up via iTunes. If you’re using an Android, press here to sign up via Stitcher. You can also listen on any desktop computer by clicking here. What is a podcast? Read more here. 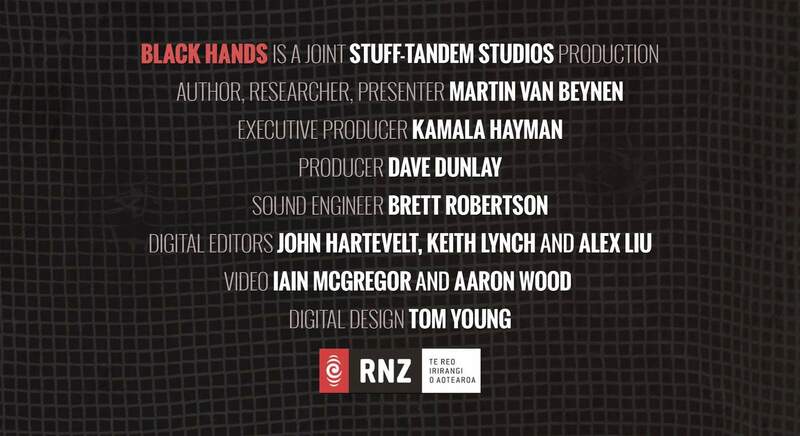 The murder scene police discovered at 65 Every Street, Dunedin on June 20, 1994, was a house of horrors in more ways than one. Weatherboards were rotten, windows had jammed, daylight could be seen through some of the walls and maggots crawled in the bathroom. The Bain family were hoarders and collectors, so the grounds resembled a salvage yard and rooms were piled up with household goods and bric-a-brac. The Bains had collected many interesting souvenirs and artefacts from their time in Papua New Guinea and these were dotted around the house. Only the front room, just inside the front door, was kept reasonably tidy. It was used for family meetings and to receive visitors. By the time the family was killed, housework had slipped even more than usual and the house had a bad smell. Visitors approached the Bain house along a path to the front door. Built around 1850, the once handsome but gloomy villa was already way past its best when the Bains bought it in 1974. 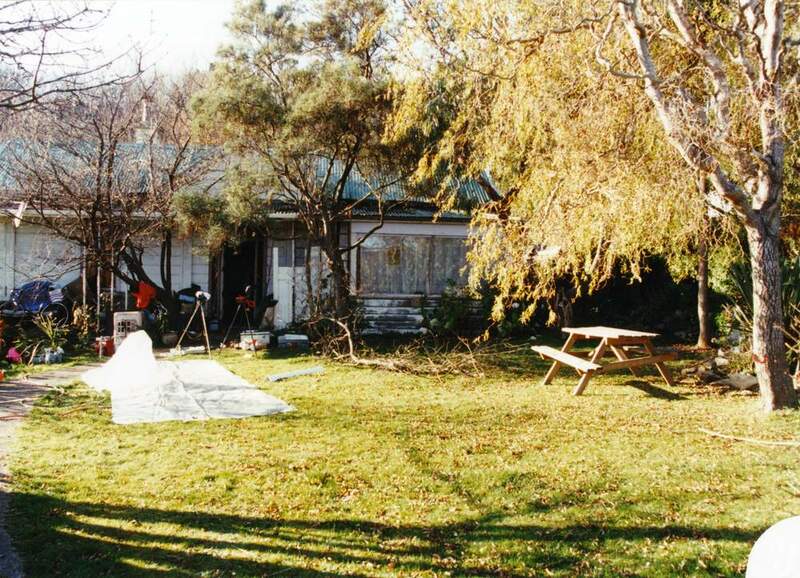 By the time they returned to New Zealand in 1988 the house was almost beyond repair. The first police on the scene still remember the uncertainty of that morning as they approached the house. Geoff Wyllie had been a police officer for three-and-a-half years when he and his partner Kim Stephenson, who had been a cop for five years, got the call to go to the Bain house on June 20, 1994. The constables, whose patch was South Dunedin, were on the 7am shift. "I was making the coffee and Kim wasn't feeling very well and thinking about going home again and then the call came over the phone," Wyllie says. Geoff Wyllie gives evidence at David Bain's second trial in 2009. "We had very little information - just to go to 65 Every St and the whole family is dead. We couldn't get any more information immediately. "So many times you get called to these things and it sounds horrendous and there's nothing. But we didn't take it lightly either." When they arrived at Every St, an ambulance was waiting outside number 65. Stephenson says he thought the call might be about a gas leak but the sight of people taking cover behind the ambulance suggested otherwise. As the officers went up the path in the dark they saw a head and shoulders in one of the windows by the front door of the house. This would turn out to be David Bain. Both constables were worried the figure might start shooting so they turned off their torches. "We hopped into the flax and watched for 20 seconds. Afterwards I said to Kim we were lucky it was David Bain not David Gray,” Wyllie says. The west side of the Bain house shows the door to the kitchen. David Gray fatally shot 13 people including police officer Stewart Guthrie in Aramoana, about 20km northeast of Dunedin, in 1990. Stephenson, who was a cop in Dunedin at the time of the Aramoana shootings, says the Gray killings didn't even occur to him. Back at the Bain house, from his position to the right of the front door, Wyllie looked through a window, seeing a gap in some long curtains. "I could see a firearm on the floor and I could see a hand." Wyllie and Stephenson were joined by Constable Les Andrew and Sergeant Murray Stapp. They armed themselves with .38 police revolvers and tried again to get David to open the door. Wyllie, who remained in the police until 2015, says he went to the window where Bain was sitting on the floor of his bedroom. David's room was the tidiest of the bedrooms. 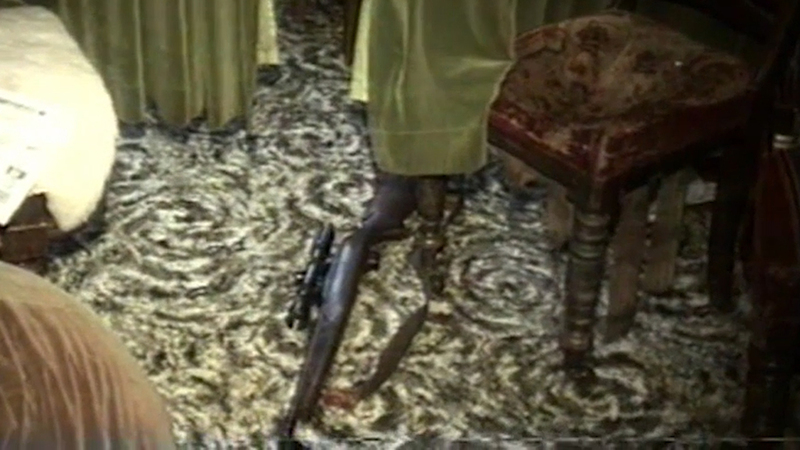 With the gun accounted for, Wyllie thought they were probably dealing with a murder-suicide. "But you don't take anything for granted. 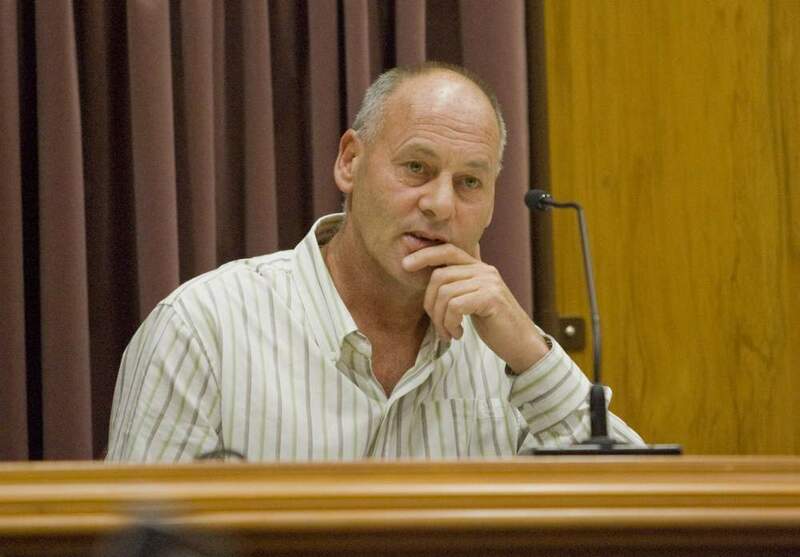 This was clearly a serious homicide and the adrenaline was running a bit." 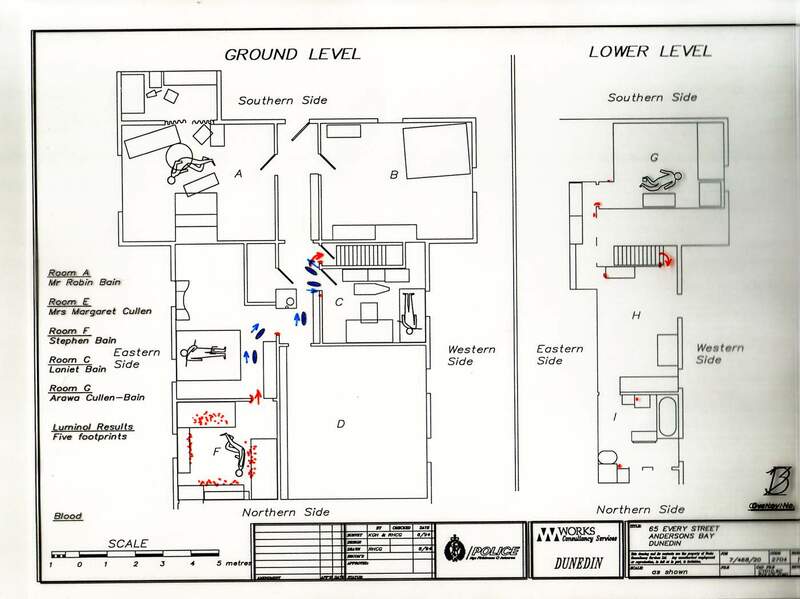 The police's scale plan of the layout of the Bain house and where the bodies were found. Their first job was to clear the house and to administer first aid to anybody who needed it. "All the training you get is that in a scene like that you don't touch anything and you don't go anywhere where you're not required. All that stuff is on your mind especially when you've only been in the job three-and-a-half years and you don't want to do anything wrong and get your bum kicked," Wyllie says. Wyllie helped to find each of the five bodies. The most haunting find was Arawa, who appeared to have pleaded on her knees before being shot. "I remember thinking that was horrendous. Looking at Stephen, he fought for his life, you think about that afterwards." Stephen's room was used as a storeroom for household items. Dozens of small arrows, posted by police, indicated blood spatter marks. Stephenson says the Bain house with all its bodies was not the worst scene he went to in his 18 years in the police. "Gun shots by comparison to car accidents are fairly clean. I just went in there and did my job. I always found motor vehicle accidents more upsetting because there was carnage and there would be people alive who need your help and you want to help. I found them worse to deal with than that scene." Kim Stephenson giving evidence at David Bain's second trial in 2009. Stephenson stayed in the hallway to cover Wyllie and Stapp after going into the lounge to find Robin dead on the floor. "I was immediately struck by the magazine on its narrow edge right next to Mr Bain's hand. Right away I thought something wasn't right. When I think about the case that's what I think about," Stephenson says. David's "weeping and wailing" also made him suspicious, he says. Wyllie says he has followed the case over the years and had often seen how polarising it could be. Stephenson says all the police on the job were switched on to not disturbing the crime scene. After the bodies were checked, the first job for police was to secure and record the scene. The washing machine in which bloodied clothes were washed. 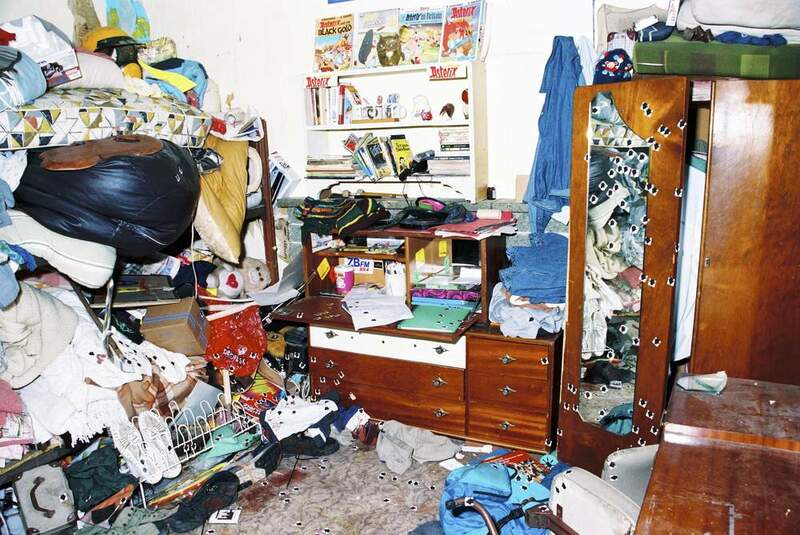 One of the most crucial jobs for the police investigating the scene was to record it before bed clothes and other items were moved to remove the bodies. Because the rooms were so closely packed and cluttered, it was difficult to move the bodies without disturbing surrounding articles. 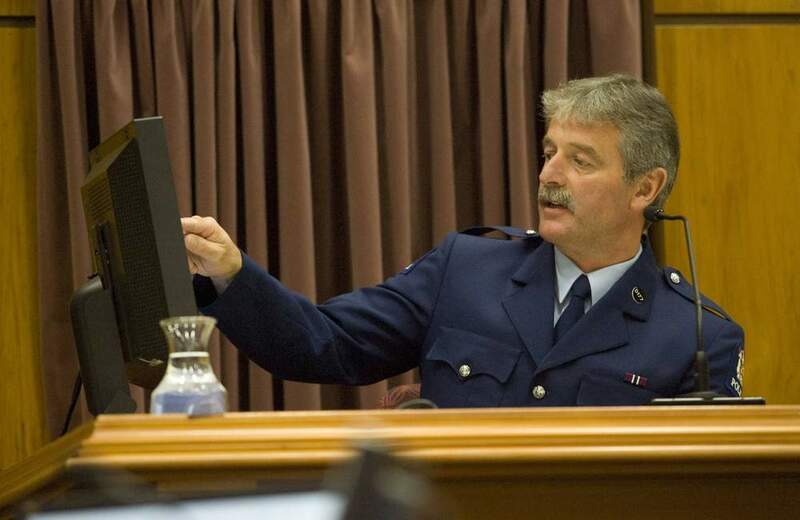 The main recording job fell to Trevor Gardener, a Dunedin senior constable and senior photographic technician who arrived at the house about 10am. He left the police soon afterwards. He was armed with a video and stills camera and first took video footage of the exterior of the house. He was then called into the house to first video and then take photographs of the individual scenes where bodies were found. 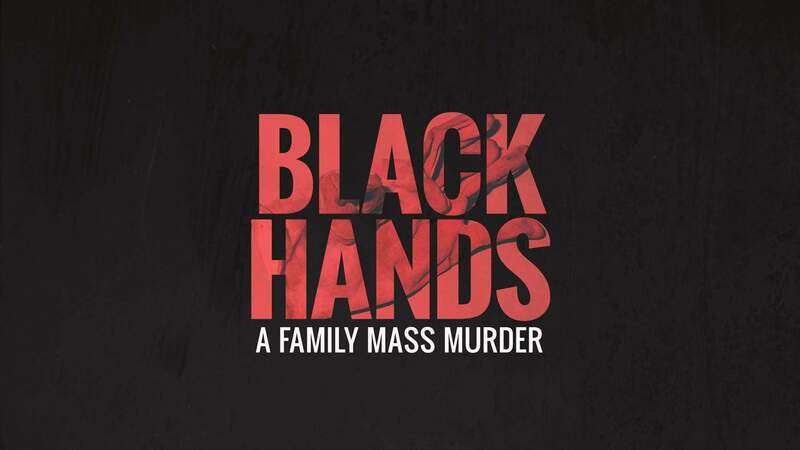 The video, taken little more than three hours after the five murders, provided the most valuable footage because it showed the various scenes virtually untouched. Gardener would be later criticised for not turning on the time and date device on the video camera and for not taking notes of where and when he took his images. He would later say that wasn’t his job. The failure would later cause problems because Gardener couldn’t tell which were the original scene photographs without looking at the negatives. Fortunately, police had the comprehensive video. The photographs would show in graphic detail how the Bain family had lost their lives. Unfortunately they could not reveal who the killer was.